House of Refuge, Randals Island, N.Y. 1860. 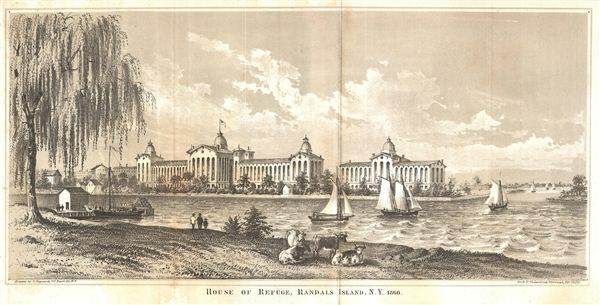 A beautifully drawn view of the House of Refuge on Randal's Island [sic], N.Y. in 1860. The drawing features the House of Refuge in the background, sailboats in a river in the middle ground, and cows grazing in what is probably Manhattan in the foreground! Randall's Island lays in New York City's east River, and is now joined to Wards Island on the south by a landfill, the site of former Little Hell Gate. The New York House of Refuge, completed in 1854, was the nation's first reformatory for juvenile delinquents and juvenile vagrants, and served as a model for other American reformatories. It was acclaimed by such visitors as Alexis De Tocqueville, Frances Trollope, and Charles Dickens. Drawn by G. Hayward of 171 Pearl St. N.Y., for the 1860 edition of D.T. Valentine's Manual.